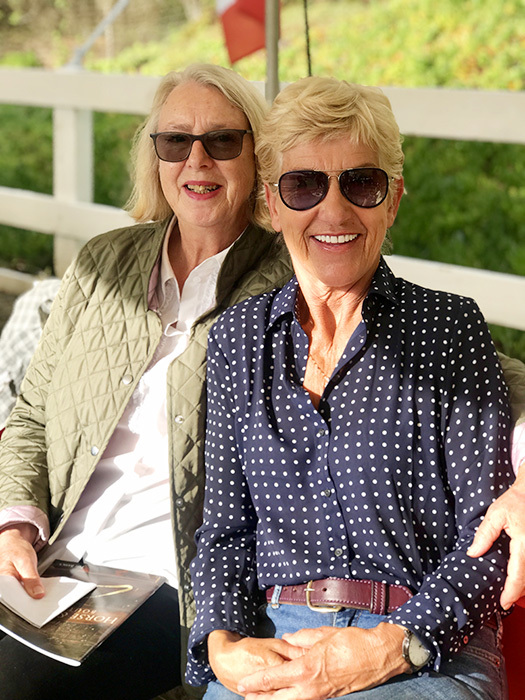 Once again my best friend, mentor, and international judge, Birgitta Bergsten, came to visit and work with me and my horses. Things are different from the judges point of view, which often is different to what we riders think!! At the end of the day the judges are the ones that will let you know if you are the winner or not!!! There are so many points we give away, just because we don’t think about it! Lines, geometry, straight and bend… The lines can go on and on! It’s super to work with a highly respected judge. Is it good?? good enough?? or not at all!?? That’s the question! Straight is straight, correct is correct…That’s the thing! Birgitta was almost my first riding instructor, and I was 11 years old! She taught me to ride - taught me to teach. She is my rock! She has judged Isabell Werth, Reiner Klimke, and all the rest. She has traveled the world, judging - so many stories to tell. But the best is, what is correct is correct, and we all have to work to do it right! I love the journey, never feel that I know how to do it, but I’m working on it, with trainers, riders, and friends to be the best I can! Thank’s Birgitta for taking 10 days to come and help me! Thank’s to Anna Blomdahl to help out with everything!! Very much appreciated!!! She also got help with some tests! Anna did go through Int II on her super nice horse Lourdes, and Third 3 on Zara!! Very exciting! Next week Anna and I will ride at the Halloween Spooktacular Dressage Show In San Diego. I will bring out Ram in PSG for the first time, and Anna with Zara in Third 2 and 3. It will be a fun show! Thank’s Birgitta for a super fun time!